A comprehensive building management system for Bangor University’s state of the art new student accommodation village – St Mary’s. All BMS installation was undertaken by Nyke Energy, providing an effective and efficient installation and comprehensive electrical testing. Nyke Energy undertook a comprehensive commissioning exercise ensuring all plant operated effectively and efficiently across all blocks. Bespoke BMS system graphics were created allowing user modifications and interrogation of the BMS through Cylon Command Centre software on local and remote bureau PCs. St Mary’s Bangor University was our first project with Nyke Energy Services and it has been a total success. Nyke Energy supported our initial bid for the project and took an active part in developing the design. Once on site we had an enjoyable experience as the project was installed and commissioned with no problems, we would have no hesitation in working with Nyke Energy again in the very near future. Nyke Energy were commissioned by H E Simm working in conjunction with Vinci Construction and Bangor University to supply, install and commission a comprehensive building management system at St Mary’s residential village at Bangor University. Located on an historic site which overlooks the city of Bangor, St Mary’s was a new 600 bed student accommodation village yet still retaining an original quadrangle and 1906 buildings. The state of the art complex houses a fantastic mix of shared facilities centered around a new village square at the heart of the newly created student community. A brand new building management system was required to allow control and monitoring of all heating and hot water across all the various accommodation blocks. Control and monitoring of the domestic hot water, heat recovery units and ventilation across various accommodation blocks. Design Cylon Command Centre Graphics to allow control and interrogation of the BMS system and integrate graphics with university graphics bureau. Provide safety interlocks with the building fire alarm, gas valve, emergency stop button and pressurisation unit. Nyke Energy were tasked to deliver a new Cylon building management system to monitor and control the various items of plant throughout the student accommodation complex. In total 7 BMS control panels were manufactured in house. Control panels were equipped with the Cylon Unitron UC32 range of controllers and field devices allowing advanced monitoring and control across the site. The main control panel was housed in the Energy Centre which controlled the all the main plant such as boilers, pumps etc. The Energy Centre panel was equipped with the latest Cylon Site Guide V2 touchscreen display allowing authorised personnel a user-friendly interface into the BMS. Other control panels are located in various blocks around the complex and are networked via a RS485 communications bus allowing fast seamless control across the site. The Cylon BMS also has a TCP/IP ethernet connection allowing connection to the University’s network. Through Cylon Command Centre software, authorised personal are able to access the bespoke designed graphics from various bureau PC’s on the university complex. This allows plant alterations and notification of any alarms generated by the BMS. 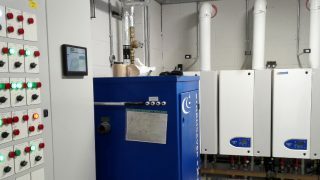 The BMS controls and monitors the main heating and domestic hot water plant installed within the Energy Centre plantroom communicating with the other control panels located in each block to provide local control. The BMS installed plays an integral role in operation of the facility and is a project Nyke Energy were proud to be involved with.